This is one of our most popular food carriers. 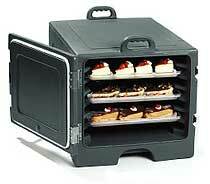 Its heavy duty design, thick doors and nylex no rust latches keep your food at the correct serving temperature. This carrier is built to last and withstand temperatures up to 200F. The molded tracks can hold up to seven 18” x 26” trays. NSF Approved.